Edwin Gonzalez, Rebecca Ostrander and Harly Neumann accepting award from JobTrain. 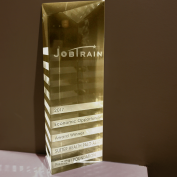 PAMF received JobTrain’s Inaugural Bay Area Economic Opportunity Award for having hiring practices and programs that open up employment opportunities for people who are talented and skilled but have experienced barriers to employment. A big thanks to Blair Arreguin, a recruiter at PAMF, who worked with JobTrain to place medical assistants at PAMF. JobTrain is a non-profit organization with a mission to improve the lives of people through job skills training and placement. A team including Harly Neumann, PhD, VP Human Resources; Edwin Gonzalez, recruitment team lead; and Rebecca Ostrander, recruitment lead; accepted the award during a ceremony at the Hiller Aviation Museum in San Carlos. Out of many submissions from Bay Area companies, 18 finalists were selected to attend the event and six winners were chosen for the award. Some of the other finalists included Google, LinkedIn, Webcor and Intel.